« Are Government Bureaucrats Corrupt and Dishonest? Nations that follow the right policy recipe can enjoy the kind of strong and sustained growth that enables huge increases in prosperity for all income classes. In other words, everyone can have a bigger slice if the pie is growing. I even tried to educate a PBS audience that growth is better than redistribution if you really want to help the poor. Talk about Daniel in the Lion’s Den! I don’t know if I persuaded anyone, but at least the facts are on my side. Consider, for instance, how the world’s two most laissez-faire jurisdictions – Hong Kong and Singapore – have overtaken the United States over the past 50-plus years. That’s been great news for low-income and middle-income people, not just the rich. So ask yourself whether you’d rather be a poor person in one of those jurisdiction or in France. The government in France has all sorts of programs to make your life easier, but you have very little hope of escaping a life of dependency. And now ask yourself whether it’s good that Obama is doing his best to push America in that direction. P.S. If you want another example of how long-run growth makes a big difference, check out this chart comparing Chile, Argentina, and Venezuela. Not only has Chile overtaken the other nation thanks to pro-market reforms, but the poverty rate has fallen dramatically. P.P.S. Since this post shares a very good image about income inequality, let’s include a bonus picture on taxation. 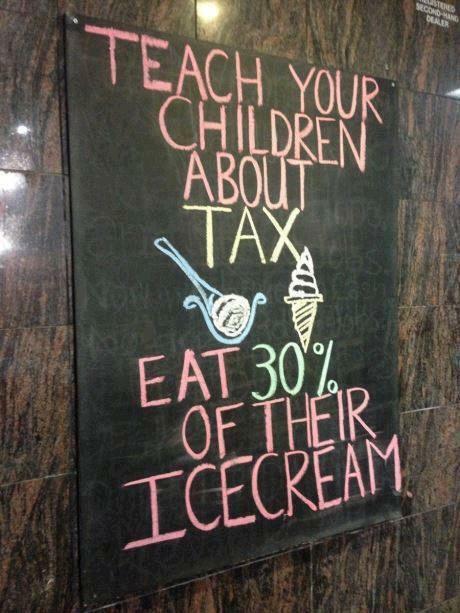 It’s a helpful suggestion on how to make kids aware of the cost of big government. Though let’s be sure to acknowledge that Obama is doing what he can to make kids more skeptical of class warfare. P.P.P.S. On a separate topic, I’ve explained that the so-called “austerity” vs “growth” argument is grossly misguided because Keynesian spending isn’t pro-growth and also because it’s important to distinguish between good austerity and bad austerity. Too many governments are choosing the wrong type of austerity, imposing destructive tax hikes on the private sector. What’s really needed in genuine spending restraint so that “austerity” is imposed on the public sector. But some folks on the left say there’s been too much spending restraint in recent years. So who’s right? Well, UBS has produced a report containing some very useful data. Viewing the global economy as a single unit, we see a very different picture to the post-crisis world of austerity – at least if “austerity” is taken to mean government spending cuts. The two largest components of global GDP, namely private consumption and fixed investment, both hit multi-year peaks in the first quarter of 2008. …Since the start of 2008, government consumption at the global level has risen by 20% in real terms, whereas private consumption and fixed investment have risen just 8% and 5%, respectively. In other words, despite talk of austerity, government spending continues to run ahead of private-sector spending. Hmmm…the burden of government has been growing faster than the private sector. That’s the opposite of what the Golden Rule calls for. And not only has government been growing too fast in the past, it’s likely that fiscal policy will get even worse in the future. Structurally, government debt, government spending, and the share of government within the economy must be sustainable. Government consumption’s share of global GDP has risen from 11% to 14% over the past 15 years. In 2013, it reached its highest level since 1980. At the same time, government debt-to-GDP ratios have hit record highs in many countries. In the long run, such elevated levels of expenditure (and corresponding levels of debt and deficit) are probably not sustainable, in particular, given other structural changes underway. For instance, demographic trends in many advanced economies pose challenges. The moral of the story is that America and other nations should be restraining budgets, ideally by enacting the right kind of entitlement reform. Though I’m worried that Obama is learning the wrong lesson from what’s happening in Europe. Indeed, this Henry Payne cartoon shows what he has in mind. And if he succeeds, this satirical 2012 campaign slogan may become reality. P.P.P.P.S. Here’s a final image that captures the essence of Washington. First, the eco-left explicitly calls for a no-growth GDP. Even for a ‘de-growth’ (decreasing) GDP. In that explicit any’s gain is someone else’s loss, there inevitably will be either fighting, or our population mysteriously will have been replaced with angels and New Soviet Men willing to sacrifice for others. Second, regarding this statement in Mitchell’s article, “So ask yourself whether you’d rather be a poor person in one of those jurisdiction or in France. The government in France has all sorts of programs to make your life easier, but you have very little hope of escaping a life of dependency.” – I would rewrite the last few words to be instead “very little hope of having a better life than that.”, or perhaps combine the two clauses. – One of the sad corrupted things about human life is how many people are ‘accepting of pottage, with dependency, so long as someone keeps refilling the bowl’. on July 26, 2016 at 12:13 pm Kevin K.
This is the dumbest article i’ve read in a while. Just another lame trickle-down economics piece of idiocy. Fleecing the poor and middle class. Regarding your ice cream analogy. Wouldn’t it be more correct to give the kid a small dish of ice cream and eat none, then give them a second, larger dish and only eat 10%, give them more and eat 15%, give them yet more and eat 25%, etc.? What do you think of Piketty’s book? 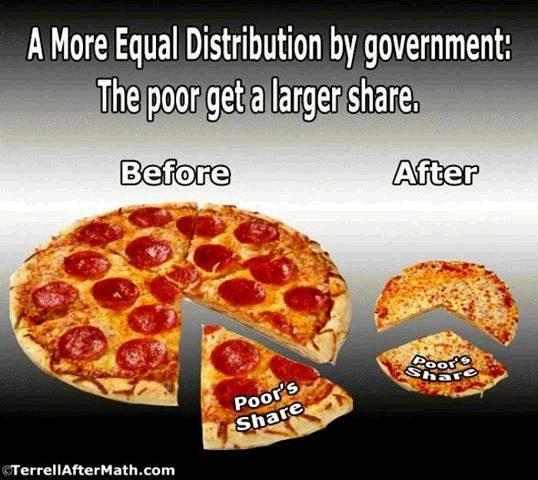 He argues, essentially, the pie can’t be expanded without increasing income of the poor and middle class. Thanks, man, now I’m hungry. 🙂 Seriously, Margaret Thatcher had such a wonderful way of breaking these concepts down and making them seem so common sense. So, a redistribution dollar today is worth five perpetually compounding growth dollars in the future. Hence the irresistible pull of the moth to the light and to the voter-lemming to decline. BTW, no think tanks dare face voters directly and tell them straight in the face how suicidal they are. It is just tabu for any think tank that wants to grow in prominence — for understandable tactical reasons. So the job falls on anonymous commentators like Zorba, who, having withdrawn from most productive work — got tired of the pitchforks, got better things to do even with modest wealth — has time and is largely insulated from his obvious voters-have-no-clothes statements (ok maybe the people’s STASI, the NSA, is tracking my IP address since I insult the majority — and obviously my suggestions would eliminate most NSA jobs — oh boy am I in big trouble now, I’ll be summarily executed by hippies on San Francisco’s Nob Hill). Yes, but the bigger pizza is in 10-20-50 years. The bigger slice is now. I just have to wait a few months, vote for a bigger slice and voila in another few months to a year, here it is. I just happen to be fortunate enough to live in a country where past Rahn style selfishness led to a bigger pizza. So now its time for the lucky American middle class to have a big slice from the biggest pizza on earth — no sorry folks, we will not share it with the other five billion of this planet who live on 8k per year. In other words, the money of our rich is ours, and ours only to keep and redistribute locally. We, the American middle class need it for ourselves only, because our once top 8% worldwide prosperity has slid down to 10% and we need to reclaim our top 8% birthright by redistribution. Besides you five billion don’t vote here in America, so you are irrelevant, really. Socialism is for us only, local. So back to the main point, who cares what happens in 10-20-50 years? Redistribution pays me here and now. Besides, Paul Krugman says that the Rahn curve is bogus, ie. we can have both big government redistribution and high growth. I’m a bit suspicious about Krugman’s have-it-all narrative, but heck I’ll take that narrative, enjoy the redistribution today and take my chances for what happens in 10-20-50 years. Those past sucker American generations endured the selfishness of self-sufficiency and now yahoo! I have a bigger pie! Its time to eat it comrades! Vote, slice and eat! Onwards to pitchfork style democracy. Majority makes right! Who will remember anything in fifty years? to France! And beyond! Argentina perhaps. The years of the great smorgasbord have finally arrived. Let’s divvy up and eat what America accomplished in the last two centuries! This is a great post indeed, on the essence of the irreversible path the American people have chosen to take their country in this early 21st century. But its time to hear from my more rational twin, the Voter-Lemming. sorry about that … had copy/pasted a link to something else ??!?! Or, alternatively, you could look at what people really do say about income inequality and how it chokes off the opportunity to forge one’s own way economically, and how it chokes off family freedoms, and respond to the questions raised there. One of my favorite quotes from “The Wealth of Nations” is “Wherever there is a great property, there is great inequality.” Adam Smith recognized that inequality is an artifact of wealth. If we destroy income inequality we destroy wealth. Saying that in polite circles of society will get you ostracized and pelted with “glibertarian”. There is a canonical point of inequality where the wealth of everyone is maximized. The ideal concept of income equality has a Gini of 0 at this point there is no freedom in society and there is no wealth. The canonical point of income inequality has a Gini of 0.521. Progressivisim as expressed in Rawls’ philosophy is fine but it is limited. If Gini is > 0.521 then progressivism will increase societal wealth, after 0.521 it destroys wealth. The Gini of the United States is 0.49 (pretax and 0.38 after tax). Progressivism is quite literally destroying our freedom and liberty, demanding universal applicability of an idea that only has a restricted domain of applicability. I go into the mathematics behind this concept in this draft paper. I look at the global impact of income inequality in this blog post and just what measures are needed to end global poverty. Esentially we have to consume as much energy as humanity has ever consumed to date every year! I don’t like you using the same false premise tactic as so many in the mainstream media. The reason Singapore and HK are growing quickly is because they don’t exclude one of the most important attributes of free-market capitalism – equal enforcement the rule of law. They are growing because capital is fleeing the fraud, corruption, and the unsustainable debt in Europe, Japan, and yes, the US. Dollar-based asset will rise as capital flees the more unhealthy horses in the fiat currency glue factory, but our turn will come…and the signs will be obvious by the end of 2015. Unfettered capitalism has given us Economic Hit Men and Corporatism, which proves everything has limits. Below is an article that initiates the discussion for a more sustainable alternative – http://twistedlittlethings.com/tlt/2014/01/25/a-sustainable-alternative-to-socialism-and-corporatism/. the working poor today live better than kings did 200 years ago.